The light from AU Mic was blocked so the telescope could see light reflected from dust grains in a disk orbiting the star. Irregularities in the shape of the disk indicate the presence of unseen planets. The image is 100 Astronomical Units wide (9.3 billion miles), about the size of our solar system. Things are getting awfully familiar out there. A nearby star thought to harbor comets and asteroids now appears to be home to planets, too. The presumed worlds are smaller than Jupiter and could be as tiny as Pluto, new observations suggest. AU Microscopii, also known as AU Mic, is a relatively nearby and common sort of star. And it is young. Things around it are just gathering together out of the leftovers of star formation. Previously, astronomers said colliding space rocks were likely responsible for a disk of dust found around the star. The dust should not otherwise be there. It followed that if there were comets and asteroids, there might be planets. In new observations with the Keck Telescope in Hawaii, researchers found clumps in the disk -- strong evidence that planets exist. 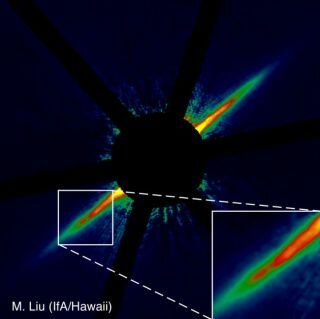 "We see multiple clumps in the dust disk," said study leader Michael Liu of the University of Hawaii. "These clumps must be formed by the gravity of unseen newly formed planets." Such clumps have been detected around other stars, but one thing that makes AU Mic interesting is that it is a garden variety star -- its kin make up 85 percent of all known stars. AU Mic is half as massive as the Sun and one-tenth as luminous. It is roughly 10-12 million years old, an infant in star years (our Sun is 4.6 billion years old). And because AU Mic is nearby -- just 33 light-years away in a galaxy that spans more than 100,000 light-years, it is much easier to study than most young stars with dust disks. Liu told SPACE.com it's not possible to tell what sort of planets might be in orbit around AU Mic, but there are clues. The planets have to be big enough to cause clumping in the dust, he explained. Theory suggests the minimum possible diameter would similar to that of Pluto. He cautions that this does not mean there are any small planets around AU Mic -- theory is not prepared to fully explain the new observations, he said. If AU Mic's planets were as massive as Jupiter, however, they should have been visible directly, since very massive planets around such a young star would still retain a lot of heat from their formation. "We don't see any such massive planets, so whatever bodies are shaping the dust must be lower mass," he said. The dust observations also reveal elliptical patterns that suggest the orbits of the planets are non-circular. The planets in our solar system, with the exception of Pluto, have take nearly circular paths around the Sun. The findings are published today in the online version of the journal Science. AU Mic joins a small but growing list of young, relatively nearby stars that seem to be developing systems at least somewhat similar to the collection of objects that orbit our Sun.